If your parents grew up during the 1980s (yes, I’m jealous too), all it takes is a quick glance through an old photo album to spot one of the boldest trends of the decade: Neon. The 1980s was an exuberant and optimistic time period. While financial success was enjoyed and flaunted excessively, the youth and their lifestyles dominated various fields from music to film and sports. Madonna rocked her infamous neon looks on stage, characters in any John Hughes film were spotted donning bright and flashy outfits, and Jane Fonda made instructional aerobics videos viral with her neon tights and matching bodysuit. The outlook for a brighter future was contagious and fashion at the time reflected this, particularly through glowing neon tones. Green, yellow, pink and blue took on a whole other aura in their neon state, packing a punch and completely contrasting the quiet, subtle earth tones of the 1970s. 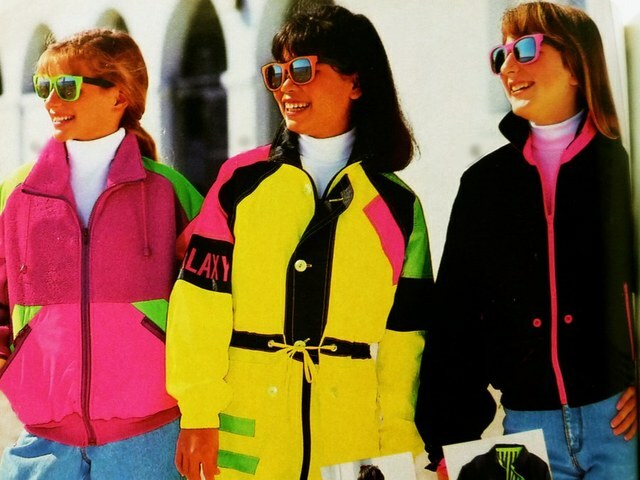 From neon sweaters to leggings, and headbands to earrings, the general rule of thumb was ‘the brighter and bolder, the better’. Though it became entwined with the 80s culture, Robin Piccone gives us an idea into the origin of the neon trend. In the mid 1980s, Piccone was inspired by the neoprene material used by the company Body Glove to create wetsuits. Utilizing any excess fabric, she cut the neoprene into tight, curve-hugging bikinis with an innovative colour palette that included “a Day-Glo rainbow of shocking pinks, lime green and ultraviolet” (Robin Piccone, 2018). This swimwear quickly took the fashion industry by storm, and perhaps this is where the neon obsession began. While a closet full of black clothing can be chic and sophisticated, don’t be afraid to embrace the optimism of the 1980s and add a touch of neon to your style. But be warned: you may just end up catching fluorescent fever!